Joint symposium by RCAS and Gadjah MadaUniverity (UGM; Indonesia) was held at UGM campus on 10 Nov, 2014. At the symposium, activities of RCAS and UGM animal Science were introduced, and then some research reports were presented by professors of each institute. 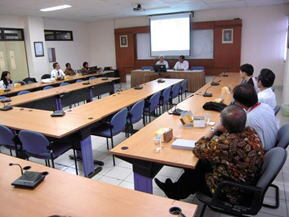 Then, the participants discussed on the collaborative education and research plans. Drs, Nishibori, Maeda, Taniguchi, Obitsu, Sugino, Bungo, Yoshimura, Isobe, and several students from RCAS, and about 10 professors including Professor Ali Agus, Dean of Faculty of Animal Science (UGM) participated in the symposium. 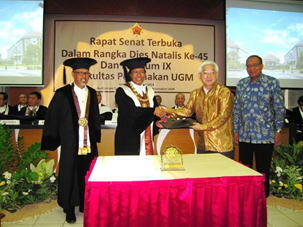 Before the symposium, Faculty of Animal Science held a big ceremony for 45 years anniversary. In that ceremony, Graduate School of Biosphere Science and Faculty of Animal Science established MOU specific for education and research collaboration. This MOU will facilitate the collaboration by the institutes. The MOU signing ceremony by Prof. Ali Agus, Dean of UGM (2nd left) and Prof Y. Yoshimura, Vice Dean of Hiroshima Univ (2nd right). Special seminar on “The mechanism of the cell membranes fusion of ovum and sperm” was held on 17 Oct, 2014. 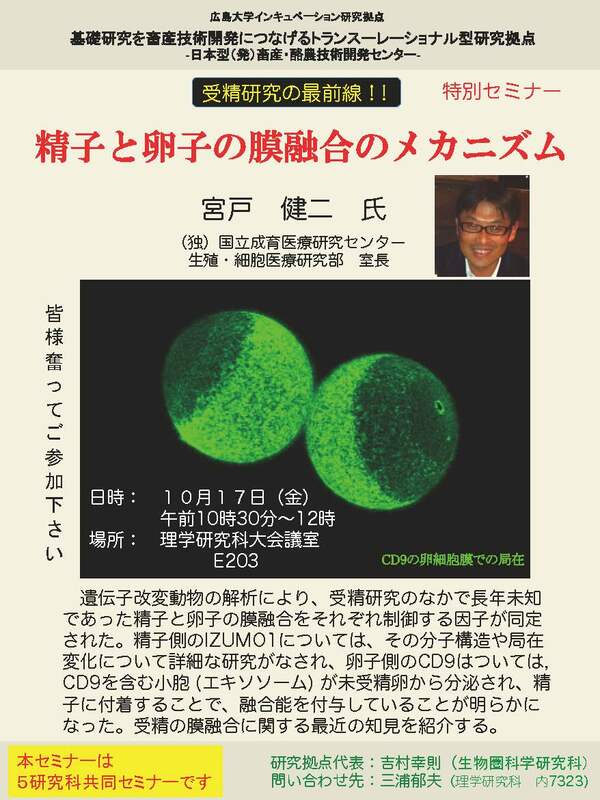 Dr Kenji Miyado (National Center for Child Health and Development) was invited, and he presented the suggestive lecture including the latest information on the factors responsible in the regulation of cell membranes fusion of ovum and sperm.